We want to hear from you! What advice do you have for our fundraisers to help them reach their goal? Utilize all of the amazing sources available to you: social media, email, texting, phone calls, in-person, letter writing, etc. to share your campaign. Start small with those closest to you and really explain why this is so important to you. Ask someone directly to help get your campaign started by making the first contribution. Get the ball rolling early! It is great to have a big wave at the beginning of the fundraising process so that your letters sent out a week later can say things like “Thanks to supporters like you, my campaign is 82% funded!” People love to see that others are supporting you and might take it as a challenge (especially if you have competitive relatives)! Even if people don’t claim them, I think it is a lot of fun to have great donor rewards that are personalized to your talents in order to get people excited about donating. For example, I really enjoy arts and crafts, so I offered to draw a picture for supporters who give a $10 donation. I had one friend ask if they could have a picture per $10 they donated and I ecstatically agreed. For another campaign, I offered a personalized coloring page for $20 donors and did my best to find a coloring page online that best matched their personality or their interest. Then, I promptly sent it to them with a personalized note. If you’re lucky (or if you ask specifically for them to do so) some donors will post an image of their thank you coloring page on social media once they’ve received it to help spread more awareness about your campaign. Clear organization and structure is also helpful. If you are able to provide a specific budget for the program outlining all of your expenses and then specify how you are funding your trip through other methods other than donations that is really helpful. No one wants to pay for your entire trip, but if you mention you earned a scholarship or are applying for one or an internship or a fellowship and you already set aside X amount of money by working extra hours and setting aside earned income, I think people understand how much this means to you and how you are doing everything you can to make this dream a reality. Above all: don’t be afraid to ask! You never know if someone is willing to support you financially until you ask. I was surprised at some of the names that appeared in my donor list. Yes. I do wish there were less fees as I lose about 10% of income made on FundMyTravel, but I really appreciate how easy it is to utilize the website and campaign. What was your favorite FundMyTravel campaign that you created and why? 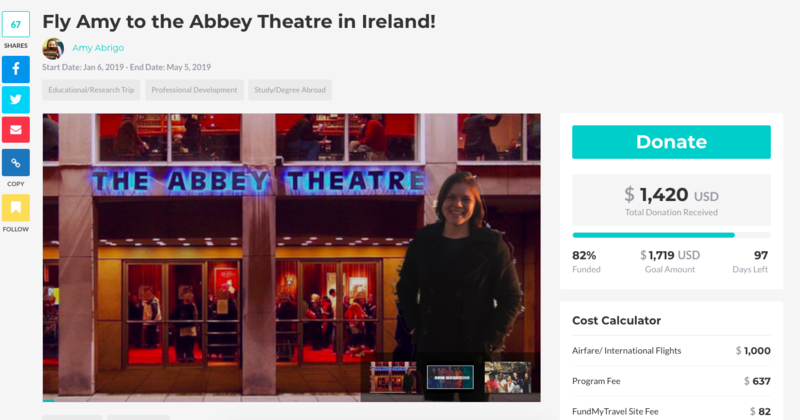 My current campaign, Fly Amy to the Abbey Theatre in Ireland! is my favorite because I am building this campaign just after completing a Master’s Level Fundraising class at Villanova University. I feel like I am really able to see how the things I have learned in the classroom have helped me be a more successful fundraiser. I also feel so blessed to have so many friends, family members and co-workers who support me and believe in me enough to donate their money, time, skills or knowledge to me. For example, I wanted to apply to a fellowship to help fund this program and two of my professors offered their time, skills and expertise to give me feedback. When I wanted to also apply for a scholarship, several of my friends offered to read through my scholarship application drafts and give me valuable feedback. I feel really proud of this campaign and I feel so supported by others. How does this experience affect your future? 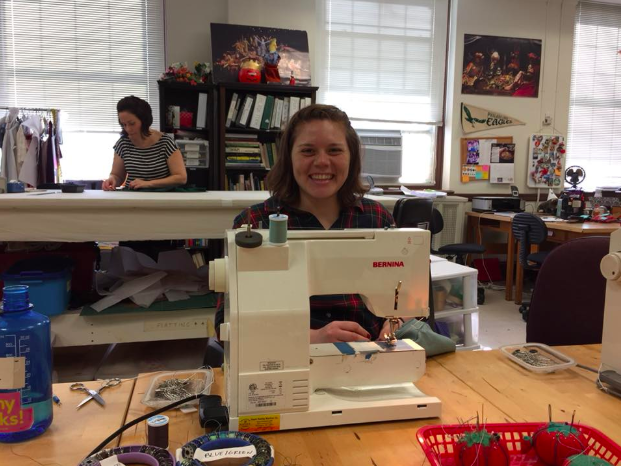 Amy Abrigo working in the Costume Shop at Villanova University as a graduate student. Villanova’s 2019 Irish Theatre Summer Studio in Dublin and Galway, Ireland will allow me to earn necessary course credits and separately complete the primary research for my required thesis project, provisionally titled: Understanding the Perception of Women on the Abbey Theatre Stage Through the Lens of Costume Design 1904-1914. This program will also allow me to study at one of the most renowned theatres in the world, the Abbey Theatre. As a future artistic director interested in global partnerships, I believe Villanova’s Irish Summer Studio would give me the opportunity to make professional networking connections at the Abbey Theatre. These relationships will be built not only with the faculty onsite, but also with other graduate students from Villanova and other universities around the world. 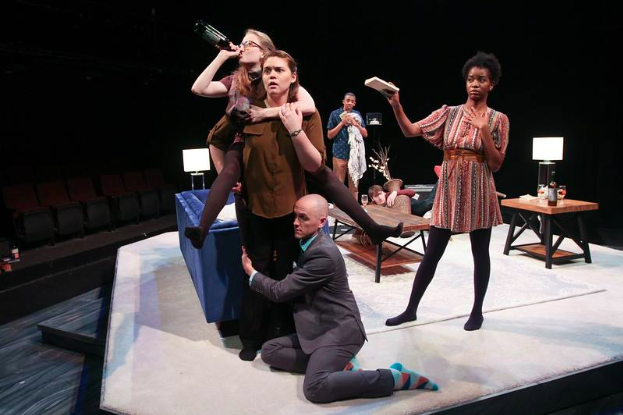 As a student seeking a Certificate in Nonprofit Management, I am interested in learning how the Abbey Theatre grows and maintains its relationships with universities and theatre companies around the globe. I am also interested in studying how a national theatre functions, what purpose it serves to its nation, and how a national theatre model can or cannot be replicated in the United States of America. Academically, this program gives me the opportunity to gain a basic knowledge of Irish Theatre History and the importance of the Abbey Theatre in shaping that history. Through my studies, I hope to learn more about prominent Irish playwrights, gain additional acting experience, and build my knowledge of and experience in new play development. Outside of the classroom, this program will give me the experience of living and studying abroad for an extended period of time and demonstrate what knowledge and open-mindedness develops when attempting to adjust to a culture or a home that is not your own. Villanova’s Irish Summer Studio also includes a trip to the National University of Ireland, Galway (NUI Galway), which houses the Abbey Theatre Digital Archive. This archive is bursting with newly digitized primary sources to which scholars have not previously had access. Among those sources are hand-drawn costume designs dating back to when The Abbey Theatre was founded in 1904. I intend to use these designs as primary resources for my thesis project. This is truly a once in a lifetime opportunity and I must take advantage of Villanova’s relationship with the Abbey Theatre to participate in this incredible program. I believe travel can demonstrate what knowledge and open-mindedness develops when attempting to adjust to a culture or a home that is not your own. Do you have more FundMyTavel Campaigns planned for the future? Not currently. Only time will tell. This is the only opportunity for me to apply for the Irish Summer Studio and it is the only time I am eligible for both Villanova’s Graduate Summer Research Fellowship ($3,000) and the Tony Ponturo Experiential Learning Scholarship ($2,000). I am also applying for an internship with the Abbey Theatre before the program, which would provide a stipend for living expenses. By working extra hours and setting aside earned income, I plan to save $1,073 for the trip. I have already raised $1,580 in donations utilizing FundMyTravel, PayPal, Venmo, email, letter writing, and social media. This opportunity will cost a total of $7,880. I am seeking $1,719 from supporters like you! Thank you for your consideration to join others in supporting my studies in Ireland. Thank you, Amy! And good luck on your campaign!